HANNIBAL HAMLIN. Autograph Letters Signed, to Sidney Perham. Bangor, Me., May 9, 1868 and Boston, May 4, 1866. 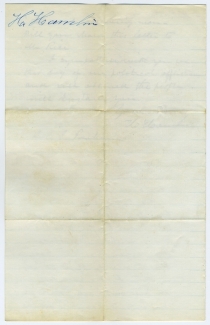 Two letters, both 2 pp., 5 x 8 in., marked “Private” and docketed “H Hamlin.” One on Custom House Collector’s Office letterhead. I hear that Judge Ware has sent his resignation to Washington. It is also said that the appointment of a successor probably lies between Fox and Talbot, Dist Atty. Now my preference is for Mr. Godfrey of Bangor. He is the man whom I would be glad to see appointed. But if it is to be either Fox or Talbot then it is clear to my mind that Talbot ought to be the man. He is a whole Republican. Fox never was but half a one at most. If it comes to that I hope yourself and Mr. Rice will aid Talbot in preference to Fox, as I believe T. the most deserving man. Will you show this letter to Mr. Rice. I sympathise with you in this day of our political afflictions and rest assured the people will sustain you. I notice all you so well say on the matter of which you write. I should like much indeed to see and confer with you, for I have some facts which I could give you and some information which I cannot write to any one. My impression is from what I learn (and what I will explain when I see you) that Mr. Wade will not offer me any peace, if he shall become Prest. If however he shall, it will be time enough then to determine what, I will or ought to do, and before determining one way or the other, I will probably see you. You can hardly tell how we all feel humiliated & mortified here at home, that the vote of Mr. F[essenden]. is the subject of bets on the street by gamblers. I feel too bad to express my feelings upon it. 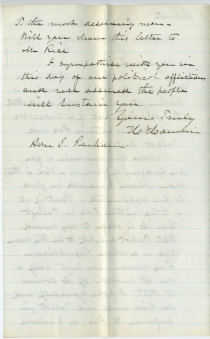 In the second letter, Hamlin speculates on his own reaction to a possible presidential bid by fellow Republican, Ohio Senator Benjamin Wade. (Wade did not get the presidential nomination in 1868.) 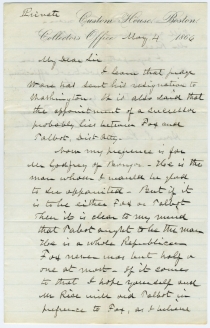 Hamlin then discusses the party’s embarrassment over the undecided vote of Maine Senator William P. Fesseden, Lincoln’s Treasury Secretary, in the impeding impeachment trial of Andrew Johnson. Ultimately, Fessenden would commit political suicide a week later by breaking ranks with his Republicans voting for Johnson’s acquittal on May 16, 1868. Sidney Perham (1819-1907) was a U.S. congressman from Maine, 1863-1869, and Maine governor, 1871-1874. Ashur Ware (1782-1873) was educated at Harvard and Bowdoin, receiving his law degree from the latter institution. He practiced in Boston, then moved Portland, Maine. He edited the Eastern Argus (1817-1820), which advocated separation from Massachusetts, and when this was accomplished via the Missouri Compromise (1820), Ware was the new state’s first secretary of state. In 1822, James Monroe nominated him for a judgeship in U.S. District Court for Maine. He resigned in 1866 after serving one of the longest tenures of any U.S. federal judge. George F. Talbot (1819-1907) graduated from Bowdoin and became an attorney in East Machias, Maine. He was twice the Free Soil Party’s nominee for governor (1849-1850), and attended the 1860 convention that nominated Abraham Lincoln for president. 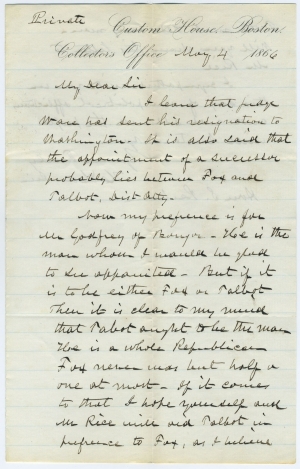 Lincoln, in 1861, appointed him U.S. attorney for Maine (presumably Hamlin is referring to the federal court district of Maine when he calls Talbot the “Dist Atty”). Talbot was Solicitor of the Treasury 1876-1877. Hannibal Hamlin (1809-1891) served in the Maine state legislature before entering Congress in 1843 as a Democrat. In 1848 he was elected by the anti-slavery wing of the Democratic party to fill a vacancy in the Senate and served until 1857 when he resigned to become the Republican governor of Maine. In 1860, Hamlin was picked as Lincoln’s running mate to “nationalize” the Republican party. Both Lincoln and Hamlin shared an opposition to the expansion of slavery. In 1864, Republican convention delegates replaced him on the ticket with Andrew Johnson, the Union military governor of Tennessee. As a War Democrat and Southern Unionist, Johnson provided strategic and symbolic power for the Republicans that Hamlin could not. The vice president would later observe that he had been “dragged out of the Senate, against my wishes – tried to do my whole duty, and was then unceremoniously ‘whistled down the wind’” (Hatfield, 203-209). He later accepted a position as collector of the port of Boston, returning to the Senate in 1869. From 1881-82, Hamlin was U.S. minister to Spain, before devoting the remainder of his life to agricultural pursuits.